Former St. Joseph School District Superintendent Dan Colgan has pleaded guilty to wire fraud and will spend a year in federal prison. The man who spent 14 years in the top job in the St. Joseph School District pleaded guilty Monday morning in federal court to one count of wire fraud. Under a deal with the U.S. Attorney, Dan Colgan will spend a year and a day in federal prison. Colgan will also have to repay $660,000 in a lump sum to the Missouri Public School Retirement System (PSRS). Colgan improperly padded the last three years of his salary using stipends, car allowances and other means. The school board knew about some of the payments but often they did not. Because all of that information was transmitted to PSRS via the web, it crossed state lines as it hit various servers. It became a federal crime as soon as the data left Missouri. The government said Colgan's scheme to inflate his salary and thus his pension started in 1997 and ended with his final contract in 2004. Colgan, 70, was dressed in a charcoal suit with a red tie that looked like kids had fingered painted on it. He said little but "Yes, sir," and "No, sir," to a series of questions from U.S. District Judge Dean Whipple. Colgan's wife and oldest son were in the courtroom, sharing an open bible. The guilty plea is the culmination of a two year FBI investigation into the school district with 11,000 students. "Today's criminal felony conviction brings to a conclusion an extensive, thorough investigation into fiscal wrongdoing in the St. Joseph School District," Tammy Dickinson the U.S. Attorney for the Western District of Missouri said in a statement. "We do not anticipate charges against any additional defendants in the future." The U.S. Attorney's office would not answer questions about the case. Colgan and his Kansas City lawyer Brian Gaddy snuck out the back door of the federal courthouse downtown to avoid reporters. For much of the past two years, the two FBI agents who investigated the case attended every St. Joseph school board meeting. Several of Colgan's associates in the school district were interviewed in their district offices or in their homes. While dozens of people were interviewed, including high ranking district officials who have since retired or been fired, this is the only criminal case that will be brought. The only person from the district in the court hearing was school board member Chris Danford, who helped blow the whistle on many of the scandals that have plagued the district for two years. But in a statement attributed to the entire board of education, the district said it's fixed many of the problems uncovered by the FBI and by the Missouri State Auditor. "The St. Joseph School District is a better and stronger district and has changed numerous policies and procedures to ensure fiduciary responsibility with funds provided from the taxpayers of St. Joseph," the statement said. 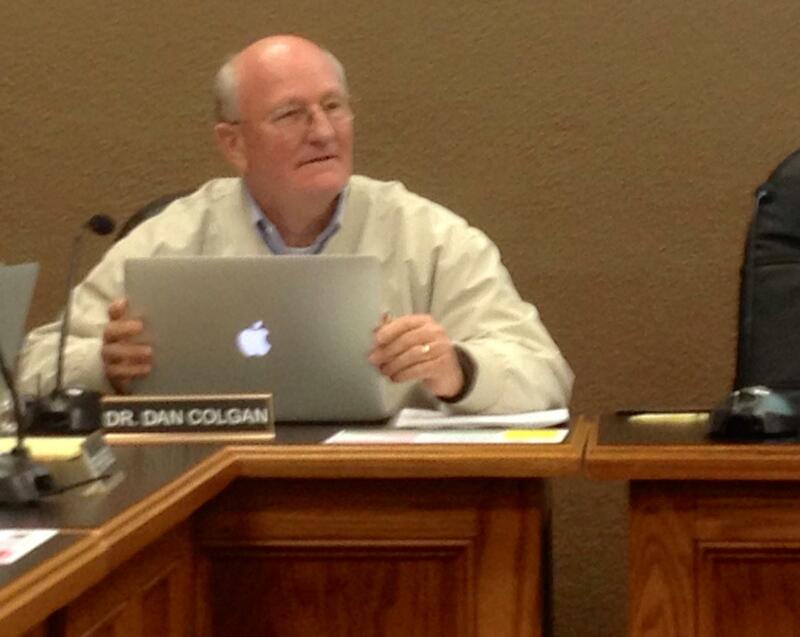 Colgan retired after the 2004 school year but was elected to the St. Joseph board of education in 2010. At that time he was a revered figure to most in St. Joseph. He rose from humble beginning on the city's north side to move up through the ranks in his home district. When he retired the district named a building after him. It's when he rose to president of the school board that scandal after scandal began to break. It started when it was revealed that former Superintendent Fred Czerwonka handed out $5,000 stipends to 54 administrators without permission from the school board. Czerwonka was fired after a scathing report from the Missouri State Auditor. The auditor uncovered up to $40 million in unapproved stipends going back years. All of those were handed out while Colgan was either superintendent or head of human resources. Since then the district has settled a slander lawsuit with its former CFO for $450,000. It ran afoul of the Missouri Department of Elementary and Secondary Education (DESE) in December 2014 when it improperly received $2 million in aid for unapproved summer school classes. Colgan will have 90 days before he has to report to prison. Two more former high-ranking members of the St. Joseph School District have repaid tens of thousands of dollars to the Missouri state retirement system after it was discovered they inflated their incomes. The Public School Retirement System (PSRS) has confirmed that Mark Hargens has repaid $90,000 and former superintendent Melody Smith has repaid $23,000. Over the last year, the embattled St. Joseph School District has had very little good news when it comes to audits and investigations. But Monday it received a report from the IRS that wasn't too bad at all. The district says after an audit that started in June it will be fined just $27,249. The fine, according to IRS documents, is for failure to pay Medicare taxes for several employees in 2013 and 2014 and for improper documentation for about 30 staff take-home cars in the same years. The federal investigation into the St. Joseph School District has widened to include another district in the state. The West Plains School District in south-central Missouri has been served with a subpoena from a federal grand jury sitting in Kansas City. The subpoena in West Plains came at the same time that the grand jury issued a fourth subpoena for documents from the St. Joseph district. Sources say the latest subpoena in St. Joseph demands expense reports and time sheets for some top administrators and contracts from certain district vendors. The St. Joseph School District, wrapped up in scandals and criminal investigations, has put at least one legal headache behind it. The district has settled a slander lawsuit with CFO Beau Musser for $450,000. Far less than many expected. The lawsuit named former superintendent Fred Czerwonka, former HR director Doug Flowers and current school board member Dennis Snethen. Czerwonka has been fired and Flowers demoted. Snethen remains on the board. In the eight page agreement, nobody admits any wrongdoing.